The state of California is incredible. It’s 163,696 square miles (yes, I just Googled this number) are packed with the stunning Pacific coast, three deserts, redwood and sequoia forests, granite cliffs, beautiful vineyards, snowy mountains, crystal lakes, strawberry fields, and of course some amazing cities! No wonder it is my favorite state in the US, who could resist living in a city that is a mere few hours from somewhere completely different? 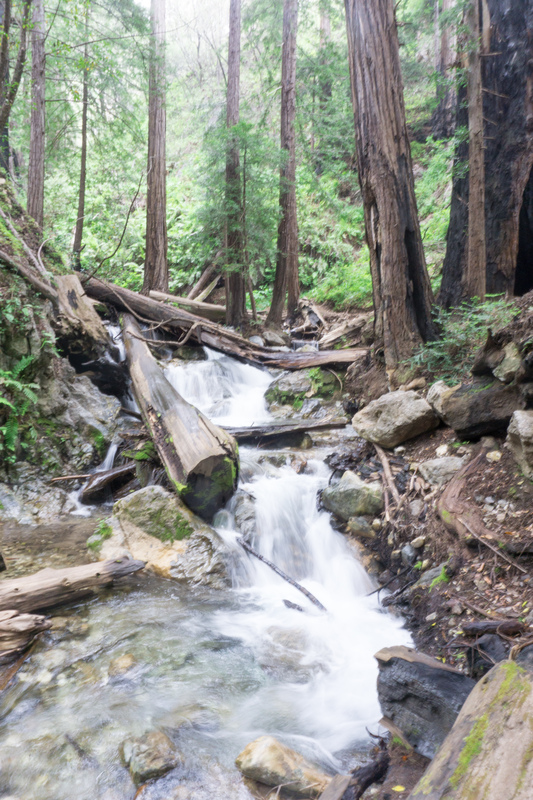 One of California’s natural beauties is the Redwood Forests. 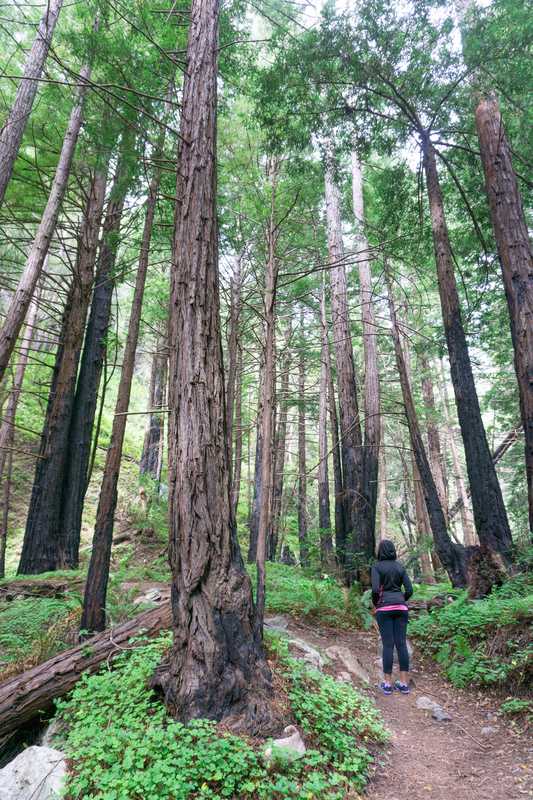 The coastal redwoods are found along the coast from southern Oregon to Big Sur. 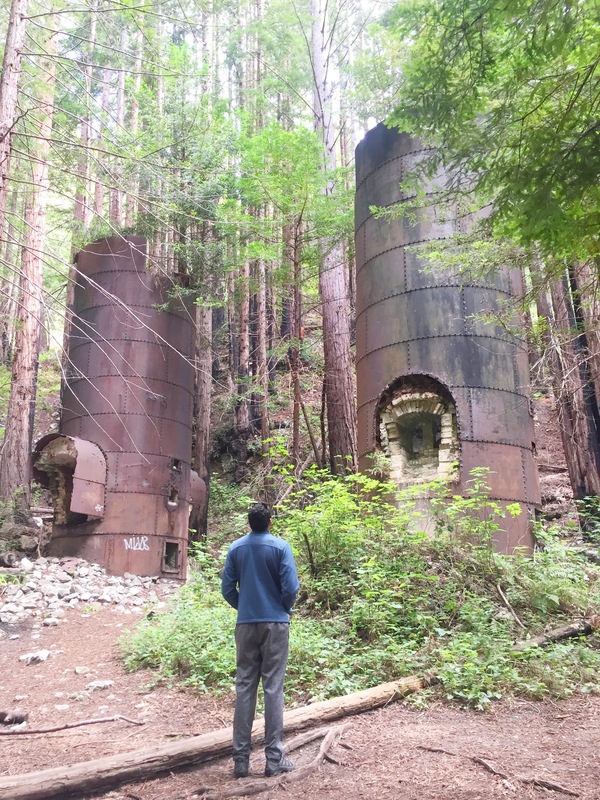 Limekiln State Park is almost the southern most area where these redwoods grow, and we were lucky enough to visit when we were glamping at Big Sur. If you head to Limekiln Park (and I highly recommend you do! ), you get to walk amongst the red giants, see the historic lime kilns (the Park’s namesake), and even a lovely waterfall! The hikes here are actually pretty easy, so it’s good bang for your buck. I love moderate hikes – you know, the ones where you don’t feel like you are going to die, but are also just hard enough to keep the tour groups at bay? The Limekiln hikes fall into this category. 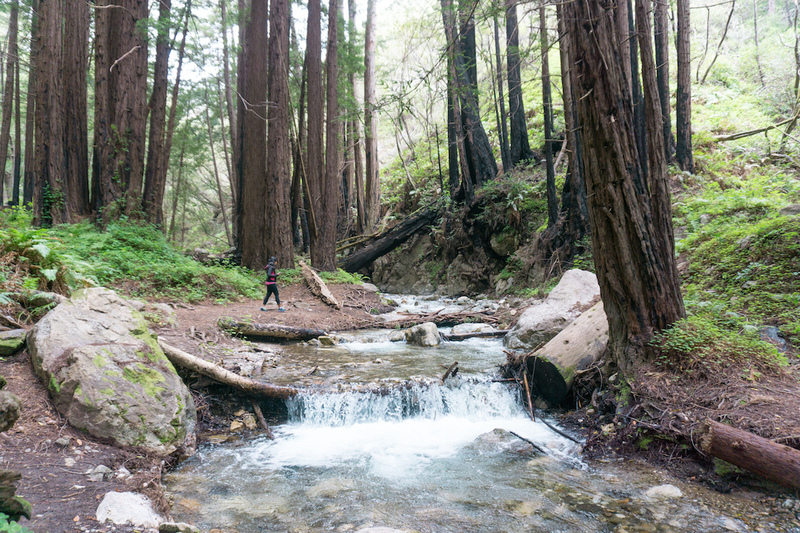 The hikes start past a picturesque campground, set by a bubbly creek. 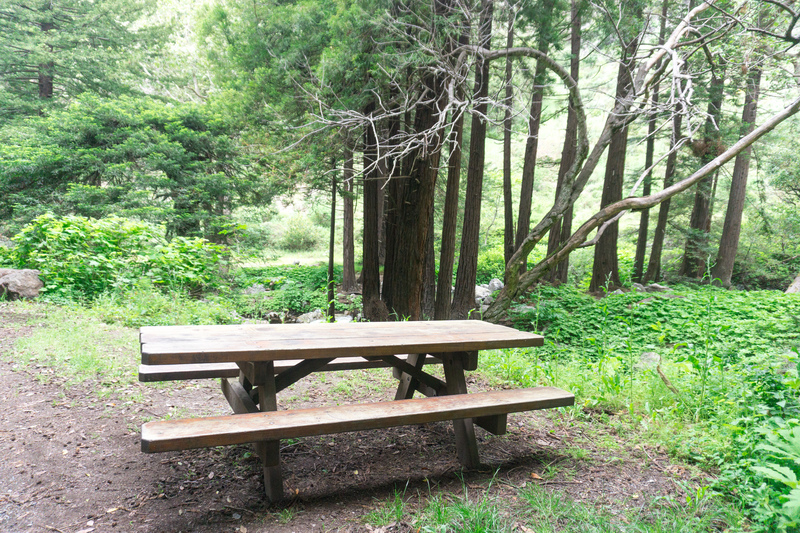 Camping here is so cheap too, so this might be a good option for your outdoorsy stay at Big Sur! 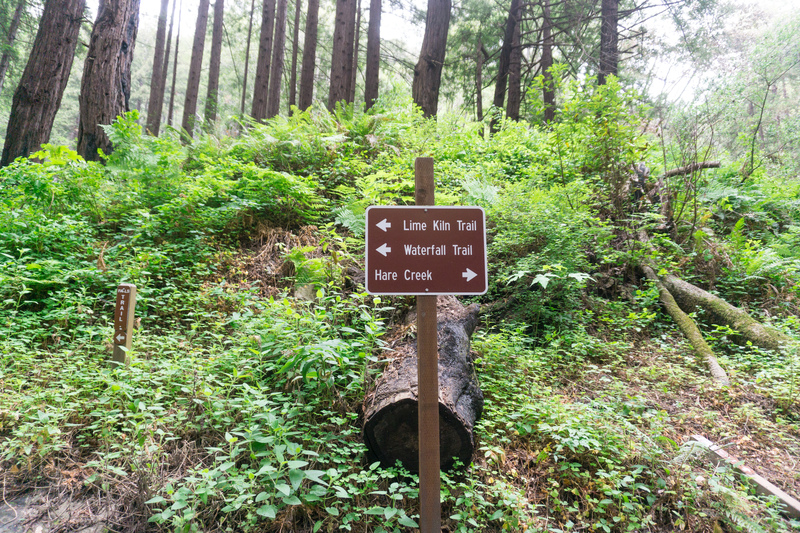 We headed toward the Lime Kiln and Waterfall trails, and were immediately mesmerized by the peace within the forest. Once we walked a little bit away from the camp, it felt like there was not a soul there except us, and the giant trees. When you go, please look up! 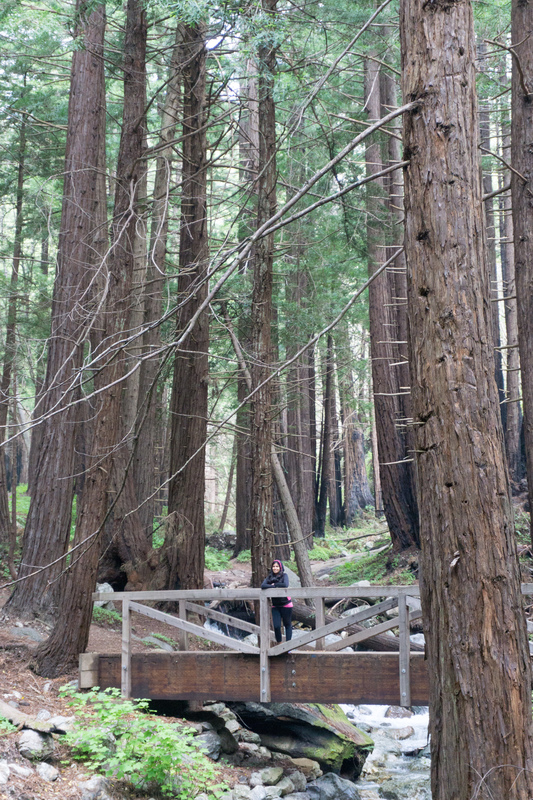 This will give you an immediate perspective of how tall the redwoods actually are. Cue a line about how insignificant we are in comparison etc., but honestly, we did not feel that. The forest exuded such a sense of peace and ease – it made us feel comfortable in our own skins, and yes a little bit significant too. The wisdom and magnificence of the trees might have somehow rubbed off on us! The trails follow the creek closely, and so it involves a few bridges, either constructed with wood and metal, or makeshifts with fallen tree trunks. The makeshift bridges are so fun! While following the trail to the Lime Kilns, you might hit a dead end, in the form of a fallen tree (not sure if this has been cleared by now). Do not be deterred, just climb over it and move forward. Basically, know that this trail should lead you to the Lime Kilns, as pictured below. The hike to the lime kilns is very short and easy (after you climb across the fallen tree that may or may not still be there). We looked around the lime kilns for a bit, snacked on some plantain chips, and met the only people we had seen in the park besides us so far (another couple who were staying at Treebones). After giving the lime kilns the appropriate attention, we headed toward the falls. For this, you have to backtrack a little till you see a fork in the road, and this lovely little log bridge. Walk across, and be prepared to hop from one side of the creek to the other till you reach the falls. This is one of the most fun hikes I’ve been on! It involves lots of scrambling, avoiding falling in to water, balancing on tree trunks, and generally being kids. 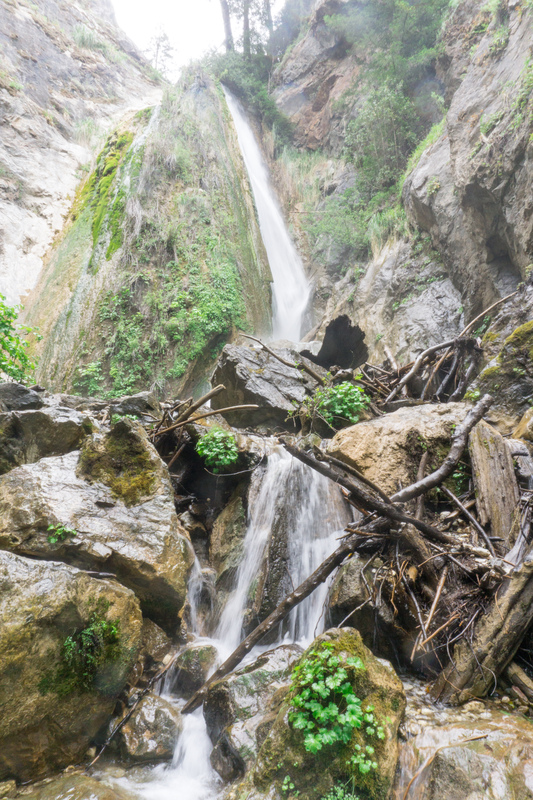 The waterfall at the end is the icing on the cake – a lovely, gushing fall, well worth the scramble. We spent a couple of hours at Limekiln park, and then headed on to eat a picnic lunch at Sand Dollar beach. I recommend you head to Lime Kiln in the morning, to avoid the crowds. 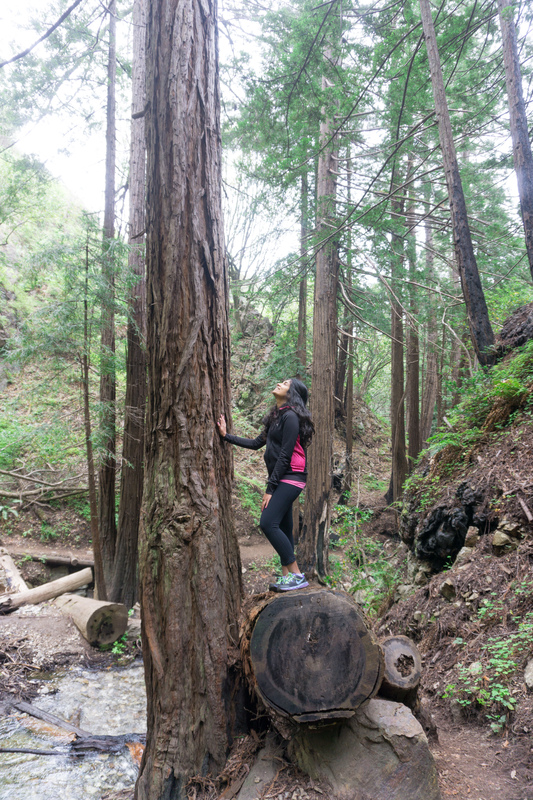 It is also a good opportunity to see the redwoods while the marine layer sits on the ocean. 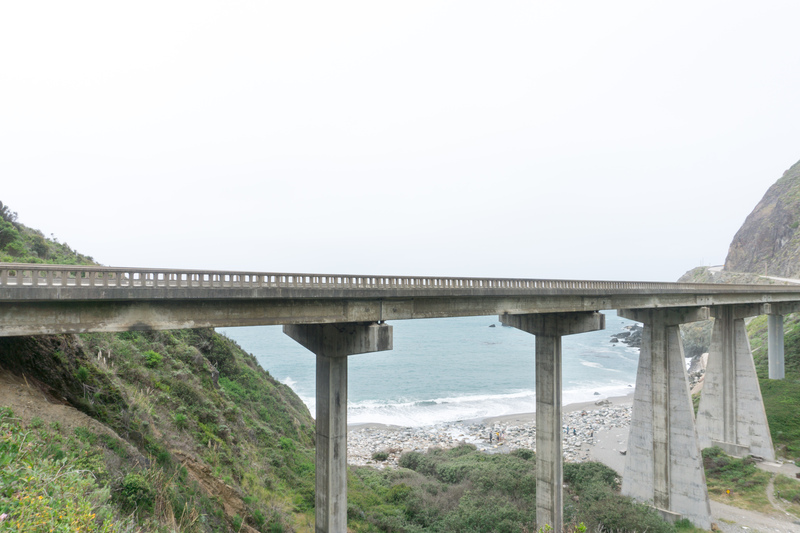 The rest of your day will be free for the Pacific and the stunning Big Sur coast. 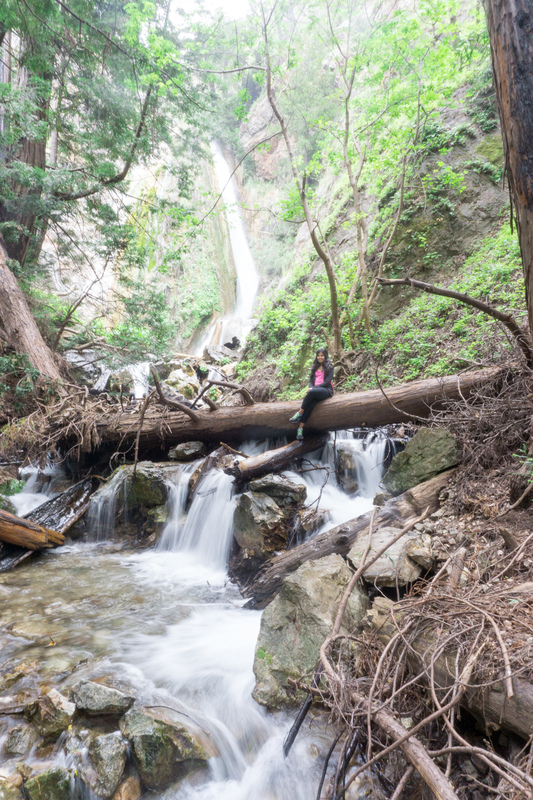 If you want to picnic at Limekiln Park, there are some picturesque spots on the hike, of course by the waterfall (but your food might get soaked), and even a bench near the campsite! 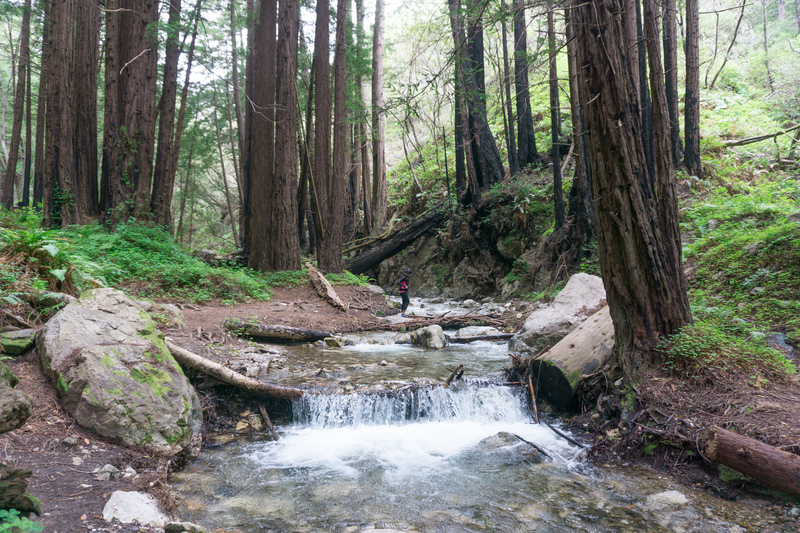 I hope you all get to experience the magic at Limekiln State Park, and Big Sur in general. I fell in love, and I cannot wait to go back! If you want more details about Big Sur, where we stayed and other activities, please read my post on Glamping at Big Sur! 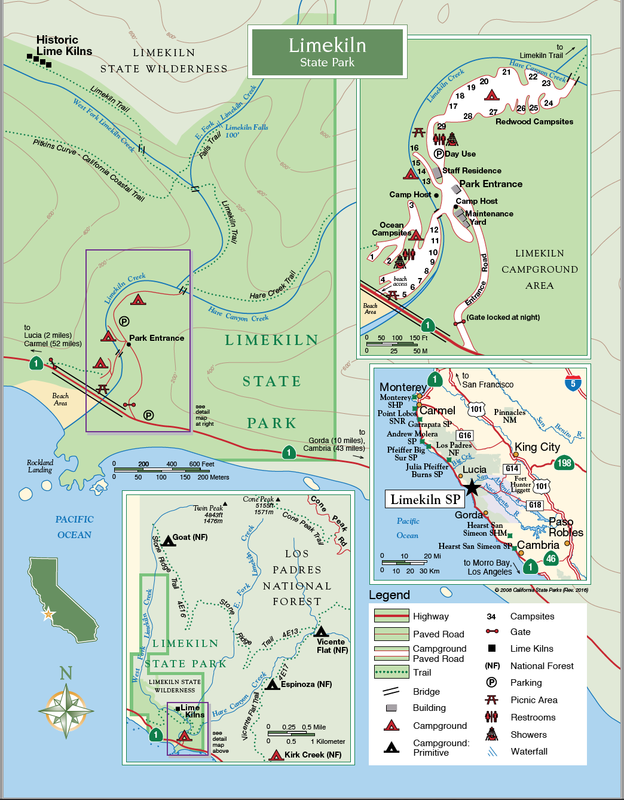 Here is a map of Limekiln Park, from the California State Parks website. Happy Planning! looks like such an amazing spot! the photos really do it justice! Wow. The redwoods sure drive home the majesty of nature! Yes that’s a great way to put it!! Wow. Though we do not hike, we enjoy seeing the pictures you have! Yes they are!! 🙂 It was an awesome trip, highly recommend! I’ve always wanted to go there 🙂 Thanks for the inspiration! P.S. Your website is so cool! Your pictures are gorgeous! I’d love to go on this trail. Road tripping along that area of the coast is definitely on my bucket list. Thank you!! 🙂 Yes, I hope you love this park, and Big Sur is def a worthwhile bucket list destination! California has such incredible nature and landscapes! I feel like I could travel there every week and still not come anywhere close to seeing everything it has to offer. I’ll have to add this park to my list of California places to see! Your photos make it look so beautiful. Thanks for sharing! Aww thank you so much Kaila!! This comment made me so happy 🙂 All the very best wishes to you and your blog! Ooohh I’d love to visit the Slovenian Alps!! And I hope you get to visit the National Parks in the US – breathtakingly beautiful, grand and humbling!